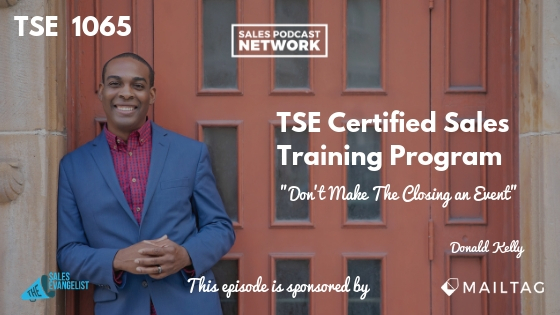 TSE 1065: TSE Certified Sales Training Program - "Don't Make The Closing an Event"
Sellers are understandably focused on the closing of any deal but it’s important that we keep things in perspective and don’t make the closing an event. The truth is that every transaction has a beginning, a middle, and an end, but we often get so focused on the closing that we unnecessarily freak ourselves out. 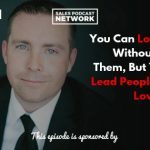 This conversation comes from our TSE Certified Sales Training Program, our sales coaching program that helps sellers maximize their effectiveness. The sales process naturally builds toward a close where the client signs the deal and then everyone celebrates. Our challenge as sellers is to avoid the temptation to make the closing the entire focus of the sale. Focus throughout the sale on building value. Initiate conversations that address your prospects’ challenges and difficulties. Realize that you’ll never get to the closing if you don’t effectively address the buyers’ objections. Help the buyer feel confident in this deal by sharing stories that provide value and dispel your customers’ objections. Instead of waiting for your customer to offer his objections, bring them up on your own terms as a way of building trust. Red flags won’t go away simply because you ignore them. They don’t typically diffuse themselves, and your decision to wait until the end of the process to address them could cost you your deal. Like many other relationships in life, struggles between buyer and seller don’t naturally disappear over time. In fact, problems often get bigger and worse as we fail to address them. A single demo for your client won’t magically offset all his concerns, so don’t wait until then to address his objections. If he has concerns about your product or service, it won’t likely matter how good your demo is: you won’t overcome his hesitation until you address the problems. 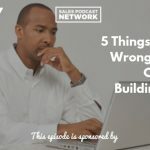 Whether you’re selling water, computers, or houses, your buyer doesn’t want to part with his hard-earned cash until you’ve addressed his fears. What if he can’t afford this house? What if an unforeseen issue comes up? How much will hurricane insurance cost? Help him minimize those risks and fears throughout the process. That way, when he gets to the end of the transaction, those fears won’t be an issue. Hubspot reported recently that as many as 40 percent of salespeople don’t like prospecting and about 30 percent struggle with closings. As a result, we tend to make closings a big deal in our own heads because we’ve worked so hard to find a prospect and get to this point. Instead of viewing it as a huge event, we should think of it as a natural byproduct of the sales process, and we should move the buyer smoothly through to conversion. Conversion begins the moment I start building value for my prospect. If I focus on blind-side challenges and identifying key problems, I can address objections early and minimize the risk that my deal will fall apart. My goal is to eliminate any reasonable doubt about whether I’m the right vendor for the prospect. If you’re able to identify the companies your prospect is currently working with, you’ll be better able to pitch your own strengths against theirs. You can identify the competition’s weaknesses and use those to make your case. Share stories about past clients who have left that company to work with you and explain why they made that choice. Build one-on-one conversations into your process as often as possible so you can clarify any questions as they develop. Once you understand the big issues that will likely sabotage your deal, you can help everyone get to the same page. Follow your demonstrations with an email outreach offering to address any new questions the prospect has. Avoid pushing objections to the end of the process. Make objections and questions a constant part of your dialogue so that you minimize any risk toward the end of the deal. Strive to create a smooth experience for your customer.